Hajimemashite. Hello, My name is Motoko Tanaka. 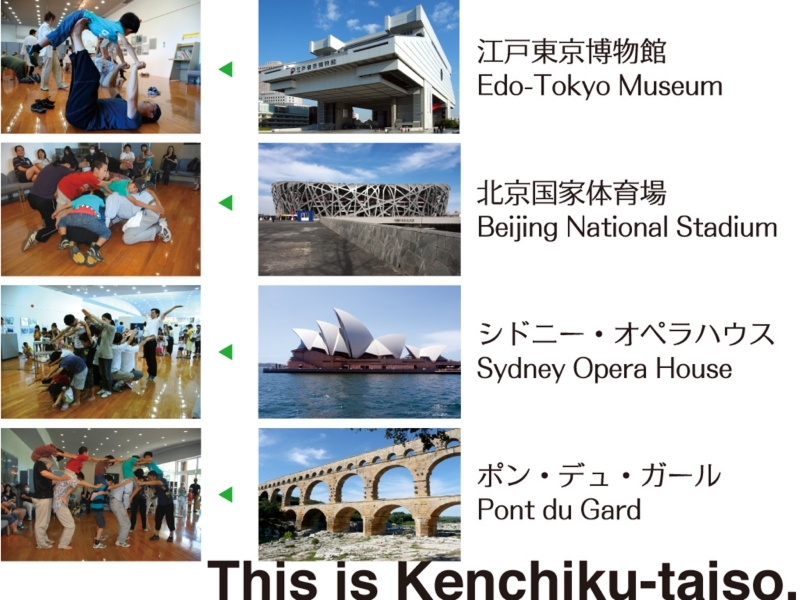 I’m member of Team “Kenchiku taiso”. I usually edit and author of books on architecture, and planning events. Today I introduce the activities most do not require language amongst them.Suddenly,do they appear to what do they do?Everyone has a various forms. It also seems appeal something. They are trying to express that the shape of the building by using their bodies. They tried building the Edo-Tokyo Museum in Tokyo, Sydney Opera House, Pont du Gard in Italy, and the stadium in Beijing. This is architectural gymnastics. The gymnastics that mimic the architecture. Not only appearance but structure, Need the first impression are expressed corporally. More than physical strength, the gymnastics needs to know and the passion to feel for the buildings. It does, the more they masters "architectural constitution." 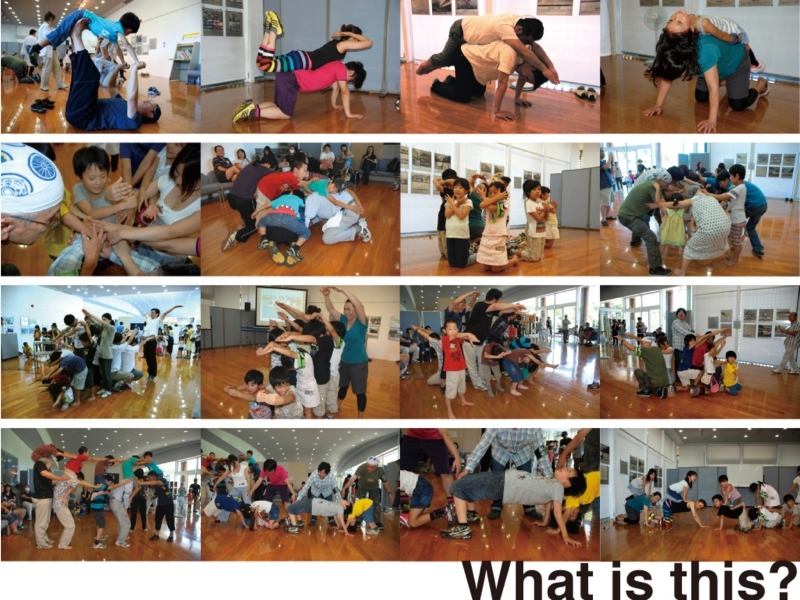 Architectural gymnastics was invented about 10 years ago for a children's workshop. Made by right, Mr. Yoneyama & left, Mr. Takahashi. 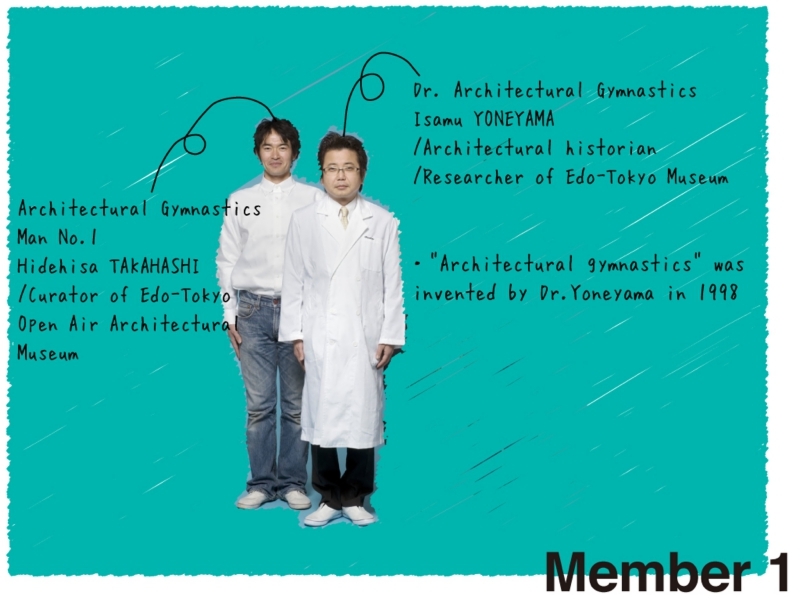 Mr. Yoneyama is an architectural historian, is a researcher of the Edo-Tokyo Museum. Mr. Takahashi Edo-Tokyo Open Air Architectural Museum curator. The first workshop began with these two guys. Motoko and Masaki, has been active in a unit named mosaki. 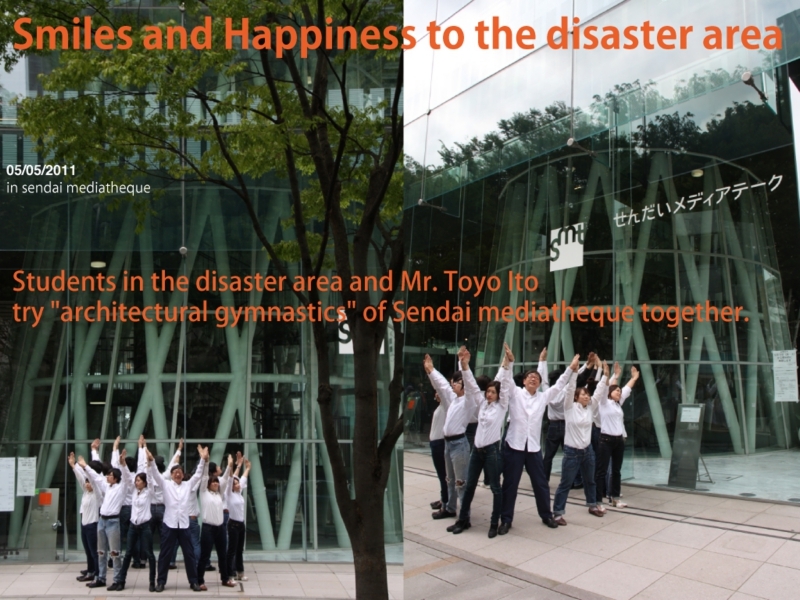 We joined "architectural gymnastics" from last year. And now foursome act "architectural gymnastics team." 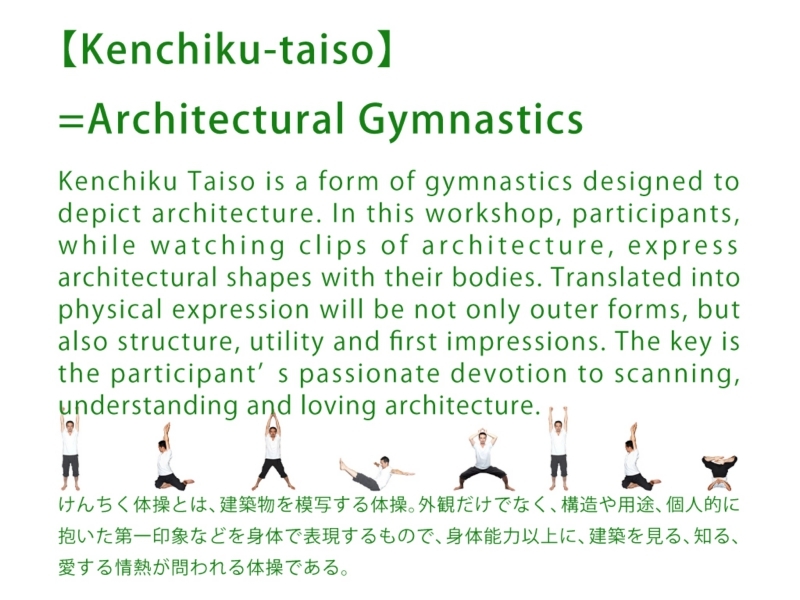 Now We are introduce the workshop program "architectural gymnastics". 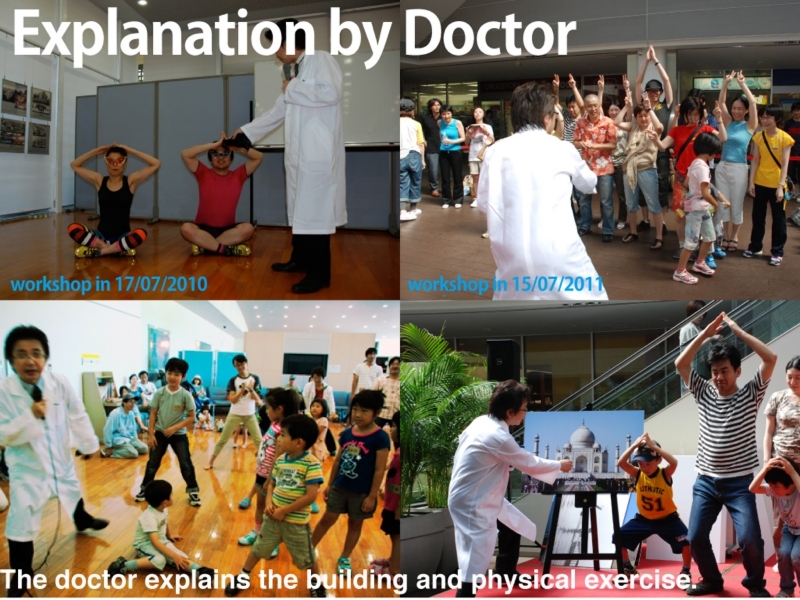 First, appearance Dr. architectural gymnastics! They are not human..... robot which the doctor made "architectural gymnastics No. 1 man, No. 2, No. 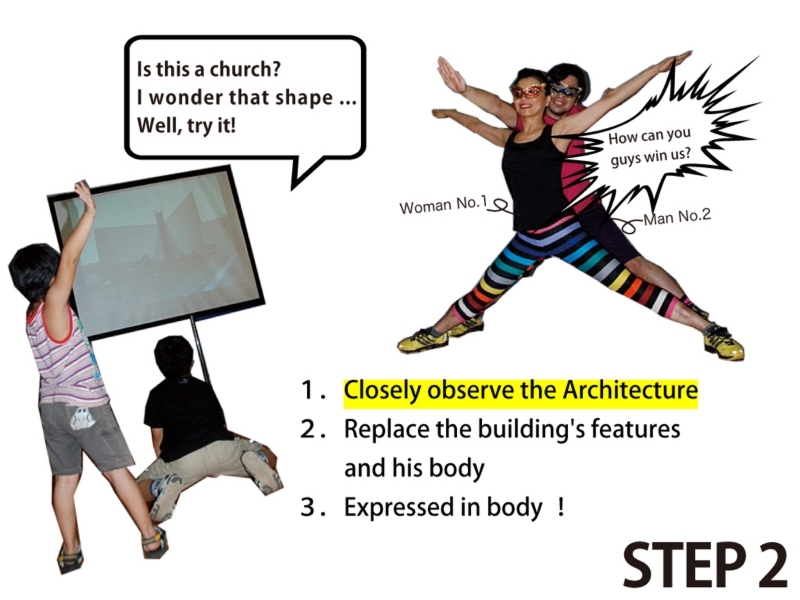 1 Woman" appeared, all the participants to "architectural gymnastics," teaches the basics. The monitor will display an the building. They look it and mimicking what They think and try to express it. I think Even looked unsure, Let's try with me. First of try the most basic "Tokyo Tower". Please try to mimic the motions of mine. Well,What do you think ?. There's more linear than the Eiffel Tower. As well as spikes in the vertex, It’s also important part of your foot stepped on solid ground. Awareness and focus will be to hand off the tip of the toe, please try to get "Tokyo Tower" on. Yes, It’s very important to lead by building and through the body can become. We call it "architectural constitution". In the workshop, Doctor discuss the history and structure, purpose, material. In addition, he evaluated for each gymnastics. He then Decide first prize in each building. 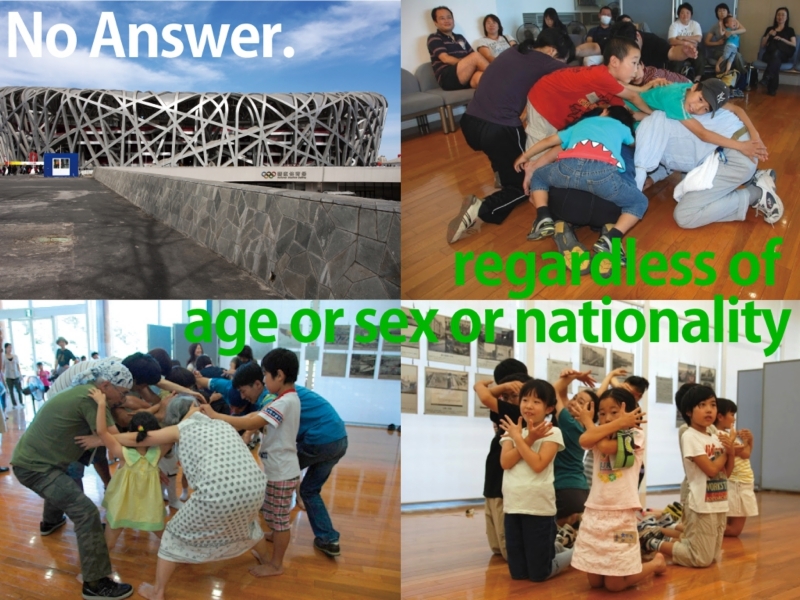 But for architectural gymnastics, there is not only answer. Actually, this picture are all architectural gymnastics of Beijing National Stadium designed by Herzog & de Meuron. 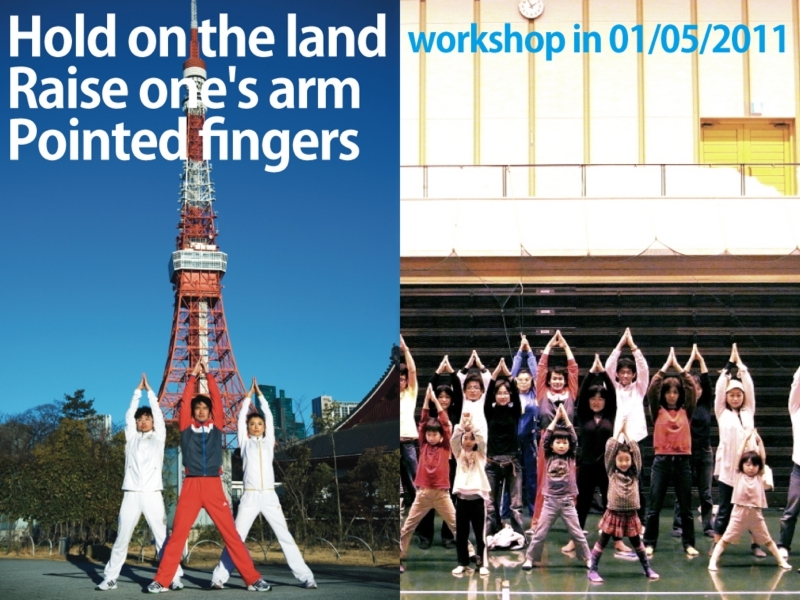 In the beginning of the workshop, everyone will try to gymnastics alone. Next is to try to gymnastics two or three, or parents and children. Later in the workshop, we create a teams of about 10 peoples. 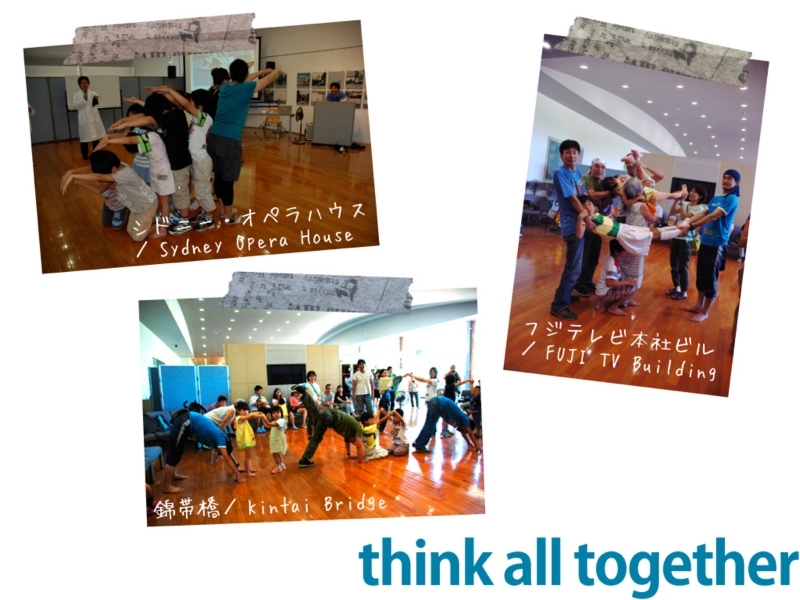 Everyone work together to make architectural gymnastics of a larger building. They start a conversation with a stranger.The scene is great!!! 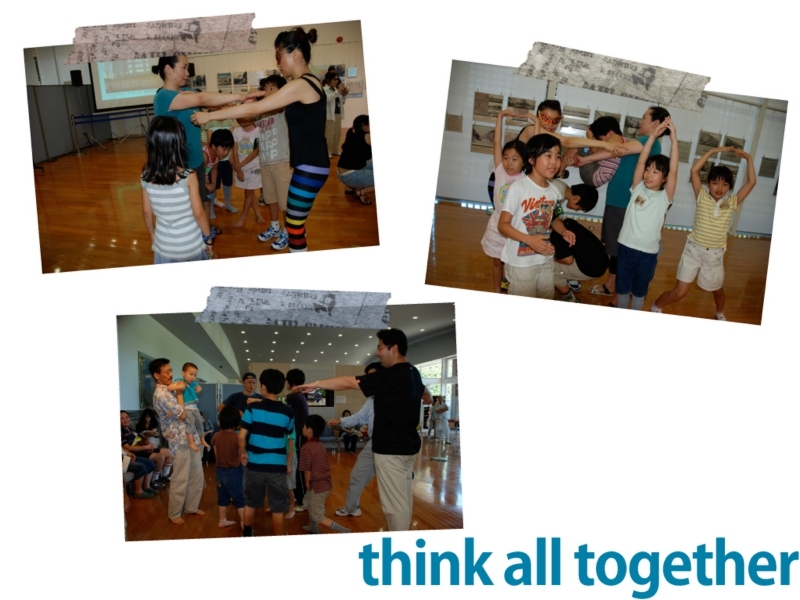 You will build cooperative with everyone. Strangely, among children born leaders. And the children of the leaders will continue to actively support. The great surprise. They are designed to be in that moment. 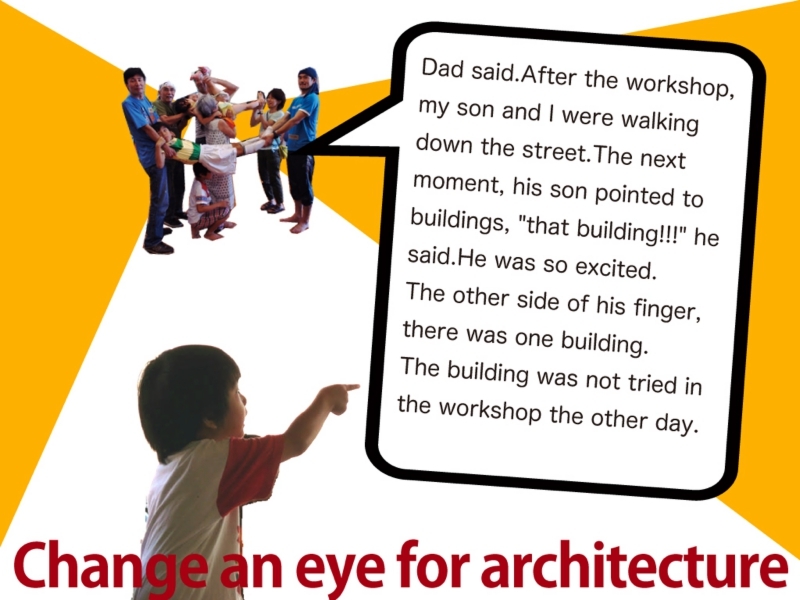 Child experienced "Architectural gymnastics" will a shift in perspective for the architecture. Step 1: push along by inches carefully Architecture. Step 2: give expression the architecture be made flesh. Step 3: Listen to the description of its architecture. The 3 steps, the participants can understand "feeling of the Architecture " . Recentry that we received many requests from schools. This photo of high school in Tochigi workshop. They are not know beans architecture, But get one's jollies. We were planning to deliver a smile and happiness to the disaster area. After the earthquake, We went to Sendai mediatheque Library. 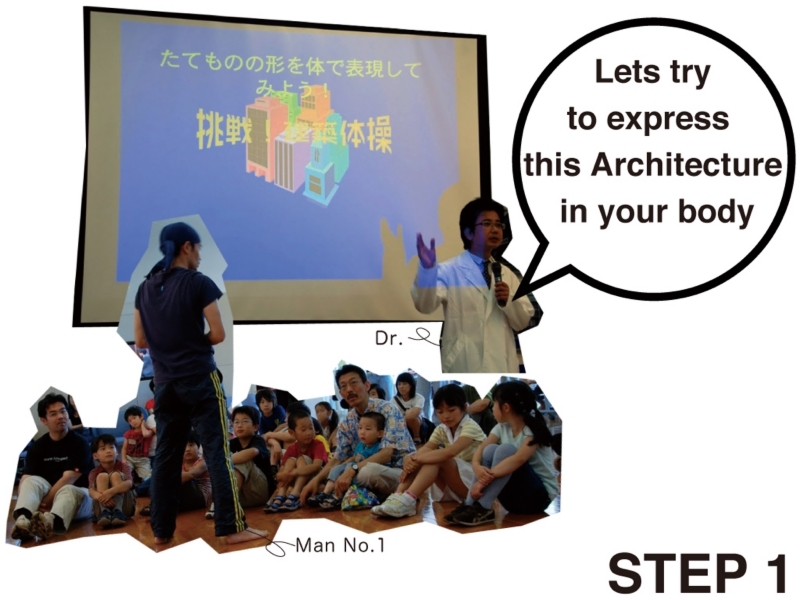 Mr. Ito and Students try "architectural gymnastics" . We have a dream. 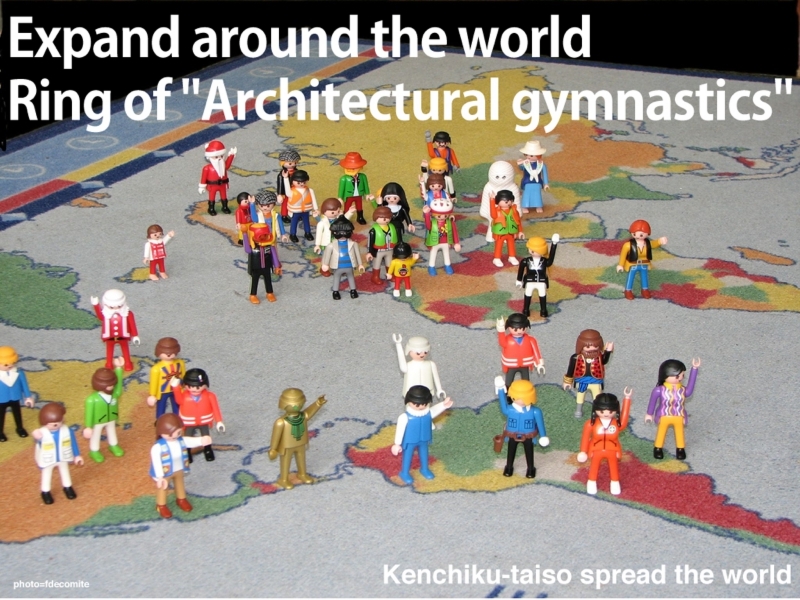 The people around the world, live in your country, "architectural gymnastics" I want to try on. And one day, we want a workshop in a webcast with people around the world. 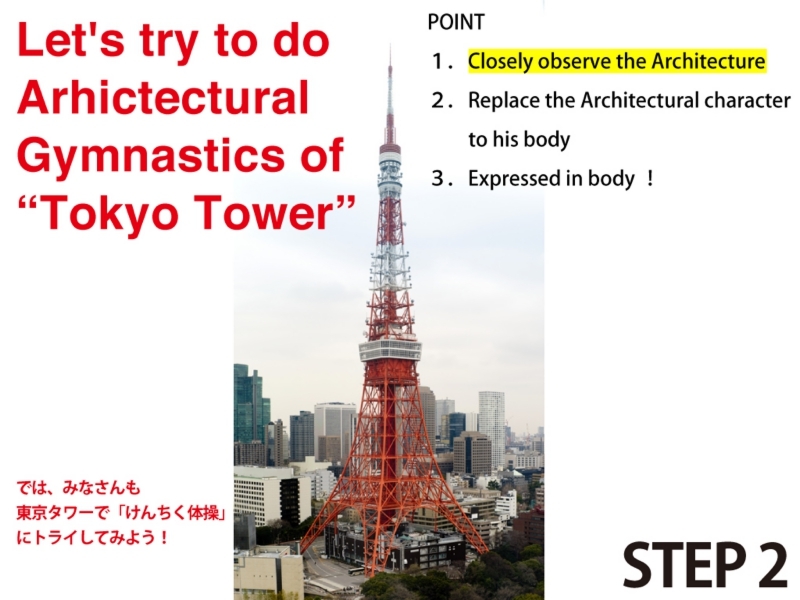 In addition, Let’s try to do "architectural gymnastics" instead of commemorative photograph. 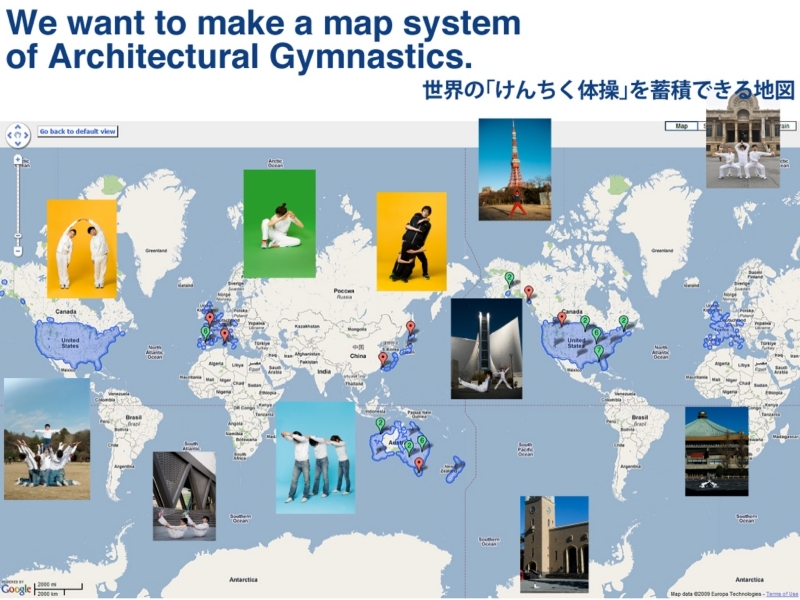 And we will make a architectural gymnastics photo map on Google. We can be seen at Google Map. And We are able to stock many photos. I think it is a very happy thing. 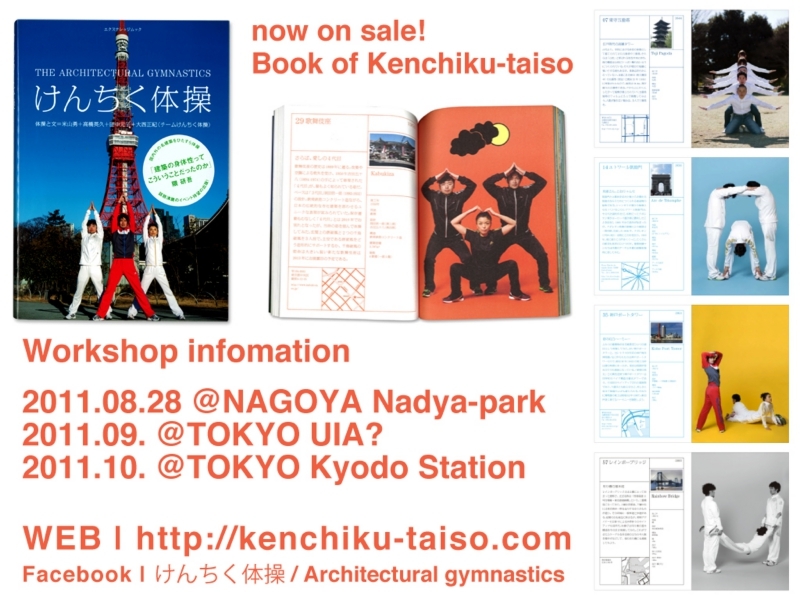 We just-published architectural gymnastics book. The book hit the bestseller list, selling 10,000 copies in the first 6monthes after its publication. 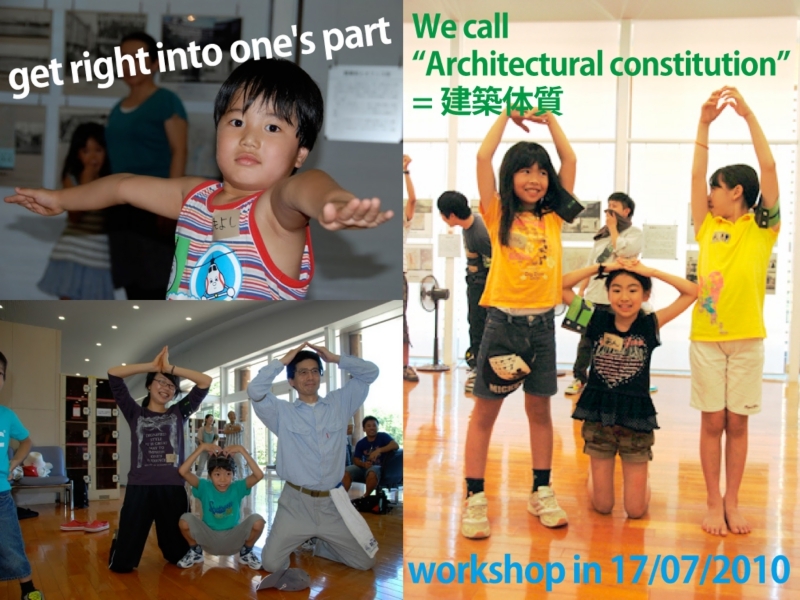 We hold workshops on architectural gymnastics, I would like to attend the next workshop very much. Copyright Ⓒ 2010 - 2016 Kenthiku-taiso / Architecture Gymnastics All Rights Reserved.